Life is what happens when you were making other plans. It's been a stressful week, my husband has been diagnosed with cancer. At the hospital for further testing today. Prayers for strength and healing greatly appreciated. Things are busy as ever these days. 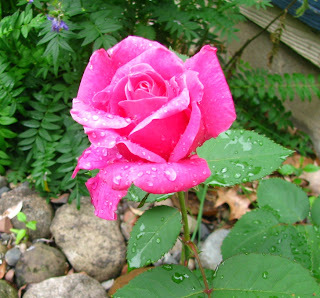 Had to take time out to stop and smell the rose! I just have one rose plant and this one of its two buds. It smells so good! Since today was our 36th anniversary we decided to go out to a movie and dinner. It's been so long since we've gone to see a movie in the theater. None of them sounded very good, until our son told us the storyline of "Super 8". So that's the one we saw. It was action packed, funny, and pretty good. A great way to spend a dreary rainy Tuesday. In honor of Father's Day, this post is about my dad. I am fortunate to still have both my parents leading active lives in their 80's. There were eight of us kids, Dad was a carpenter and avid hunter, still is. I have him to thank for my appreciation of animals, nature and the environment. 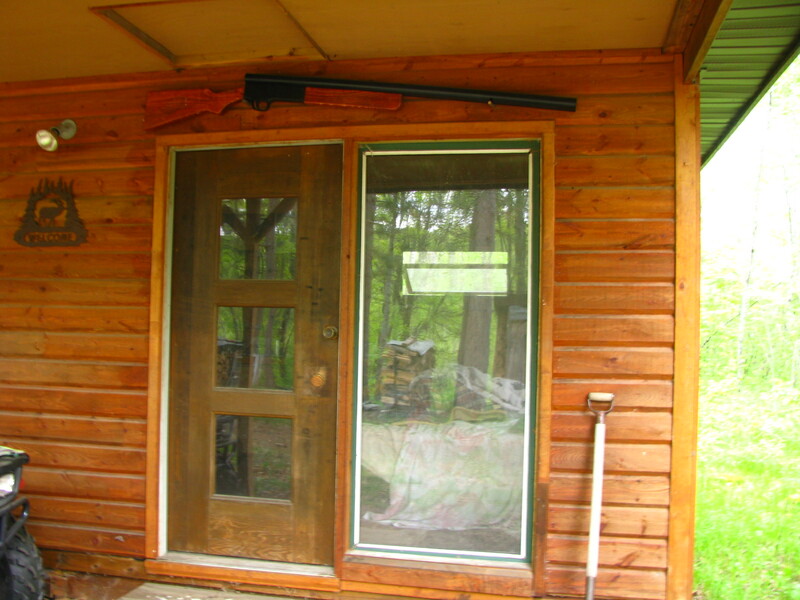 My parents divorced after 40 years of marriage and Dad went to live at the cabin in the woods of Wisconsin (which was always his heart's desire) while mom stayed in the house near the Twin Cities (which was always her heart's desire). They get along fine with this arrangement; we all have holidays together, etc. So Dad's still cutting wood for his winter heat, doing odd jobs for people, still hunting turkeys and deer, and generally keeping busy in the woods of Wisconsin with his beloved old dogs. Stan loves many of the same things as my dad. In the photo below you can see the Christmas gift that Stan picked out for Dad last year hanging over the door. That thing is huge. I was totally aghast at the purchase. But Stan was so proud and happy to have scored it and Dad graciously accepted it. In fact, it was quite a hit with all the guys at Christmas. Who would have ever imagined? Yes, Dad's happy there, but we worry about him. Dealing with health issues is one thing, but the other day a bear cub came into his yard while he was changing the oil on his truck. Belle took off after the cub and it ran up a tree. The mama bear took off too but when she realized the cub wasn't with her, she turned around and in a matter of seconds she had flipped Belle around 180 degrees and was holding her down. Dad ran over with his just opened container of oil, lifted it up over his head, and flung it at the mama bear. Fortunately for all concerned, she retreated, the cub came down, and Dad, oil dripping down his back, collected Belle from the scene. She seemed to be no worse for the wear until that night when her shoulder was pretty sore. I shudder to think of what could have happened. Saturday was a beautiful sunny day. I decided to wash up a couple fleeces -- a shaela Shetland fleece and the white Icelandic fleece I bought at Shepherd's Harvest. I've read that people soak raw fleeces in cold water before washing. They say it makes washing the fleece so much easier/faster. So I gave it a try. I put the laundry tub from my felting studio next to the garden so that the dirty fleece water could be used for the newly planted garden. Filled it with cold water from the garden hose and added the raw fleece. Let it soak and drained it out. The result? 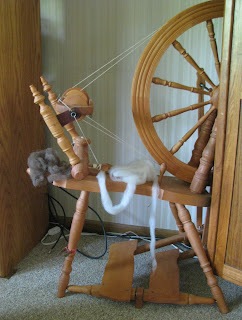 Yes, both the Shetland fleece and the Icelandic fleece washed up with one round of Dawn and just one rinse. I decided to do it again on Monday with my precious white BFL fleeces. But this time I put the laundry tub right in the garden so the water would easily reach my plantings. The trouble started when I multi-tasked, tending to the sheep while filling the tub. Got back to find the tub overflowing and tilting somewhat in the wet soil. Like a dummy I went ahead and put the two white BFL fleeces in. Then off I went to the art group for a few hours. Had a great time visiting with my friends. When I got home, I noticed the laundry tub was sitting outside of the garden fence with the BFL fleece inside. Oh NO, the tub had fallen over and the fleece fell out onto the tilled up garden soil! What a mess! Stan was home and just picked it all up and put it back in the laundry tub, garden soil and all. After an additional cold water rinse to get the MUD out, it took THREE washes in hot water with Dawn to finally got those fleeces white again. 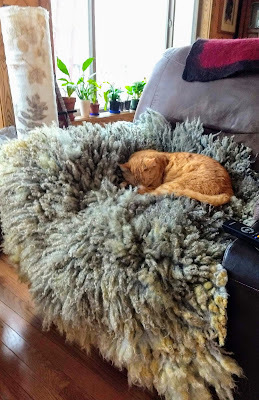 I'm so glad I saved the Harwell's fleece to be done separately (click on the photo above to can see it laid on on the table in the background). I'm thinking of felting his raw fleece like I did those two Shetland fleeces. Since BFL fleeces are harder to clean than Shetland fleeces, I was thinking the cool rinse thing might be a good idea to get rid of some of the dirt before felting it. But I sure won't put it IN the garden again! I finally got access to a real live baby to model my version of Elisabeth Zimmermann's Tomten baby sweater! I get ultra bored with plain old garter stitch and I was using a self striping yarn, so I did my Tomten in stockinette stitch with garter stitch borders. Then I started worrying that stockinette wasn't as stretchy as garter, but it looks okay on my ultra cute little model! The only thing I need to adjust is the hood, I want to add a few more rows so that it's not so snug. I had never done a hooded baby sweater before. The Tomten was a good one to start off with because EZ made it super simple. I decided to hang my birch tree landscape birdhouse out in the Honey Locust tree in the backyard. I put it out at 1:30 this afternoon and by 7:30 I saw a little bird already trying to stuff sticks inside! I'm really enjoying seeing how people and birds have responded to these little felted birdhouses! Several people at Art in the Hollow yesterday commented that they really liked the natural colored ones, so I'll leave a few of birdhouses plain and decorate the others. As part of my Forecast public art planning grant (click on the Public Art tab for all the details), I'll be hanging some of them at the Kanabec History Center in Mora this week. I hope the birds in town accept them as readily as the birds out here! The one in our front yard is definitely occupied. Of course the birds around here aren't overly fussy, I've got a little chipping sparrow in my clematis and a noisy brood in the barn, probably barn swallows. They chose this box for their nest. We had it up in the rafters for storage. I haven't seen the occupants yet, but I sure can hear them! And here's a shot of my Bridal Wreath Spirea, it's finally got a space where it can grow unencumbered. Getting Ready for "Art in the Hollow"
Super busy getting ready for "Art in the Hollow" on Saturday. I don't know what I was thinking yesterday when I thought I could do 6 birdhouses in one day. The layout took a LONG time for so many pieces. So I had one or two in the rolling machine while laying out the others. I worked on them until 9 p.m. and finally finished shaping them this morning. They still need to be decorated and hangers added. One decided it wanted to be a vessel with sparkly mylar in the karakul fiber. 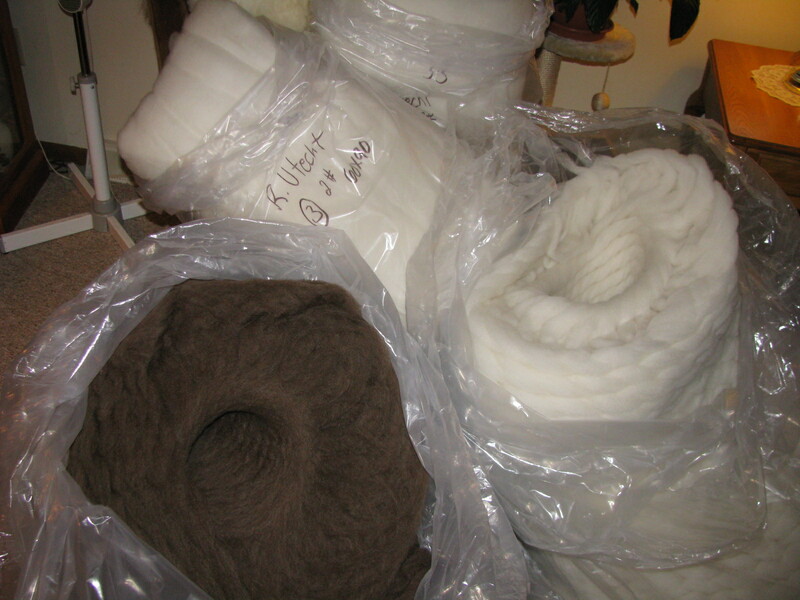 They are all lined with Shetland Mule fiber and have coarser fiber on the outside for strength. One is made with Shetland britch wool, one is made with Lincoln fiber, and the rest are all made with Karakul fiber. It's fun seeing how the different fibers felt. I still have an Icelandic fleece to try. I was working so hard on the birdhouses down in the basement, I missed the UPS guy when he dropped off my wool from Zeilingers. Finding this big box was a happy surprise when I went outside around 7. I received 8 lbs of white combed top, 8 lbs. of moorit Shetland top, and two 2# quilt batts made of Ile de France/Dorset wool. Zeilingers will ship the dark Shetland Mule combed top when it's finished. I can't wait to see how that spins up! I had to take a moment to spin up just a little of the white combed top last night. It's a mix of Shetland, Bluefaced Leicester and Shetland Mule fleece and neck fiber. 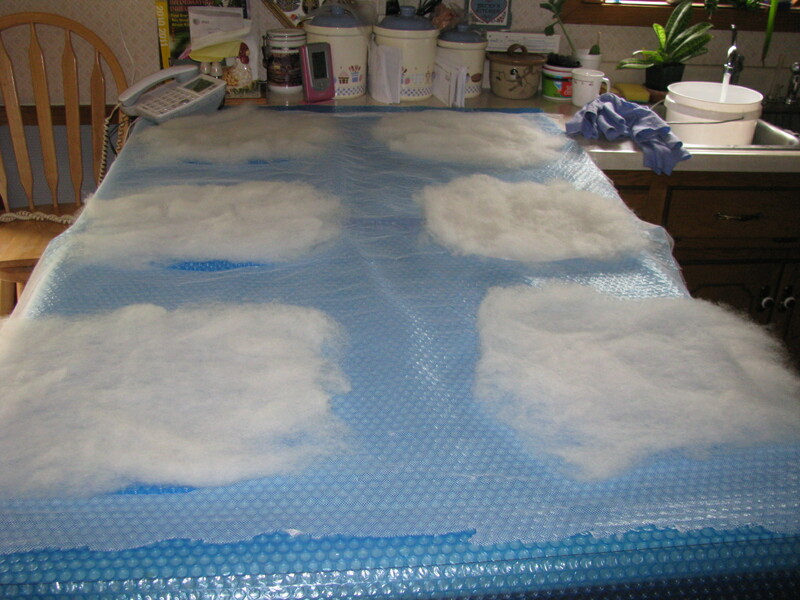 Rather than throw out the finest areas of the fleeces due to excessive VM, I saved them until I had 8 pounds (washed) -- enough for a run of combed top. 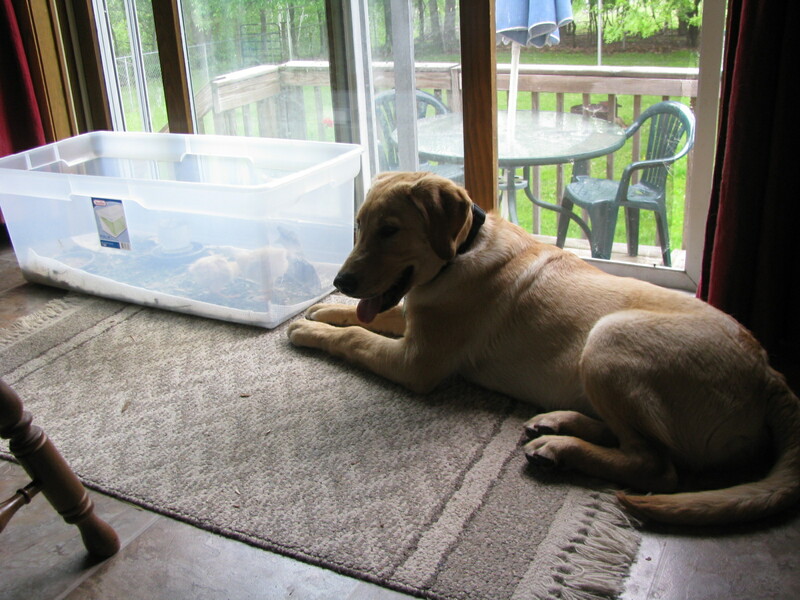 Rocky is getting bigger and Stan says he's a going to be a good hunter someday. Here he is drooling over the Buff Chantecler chicks this morning. 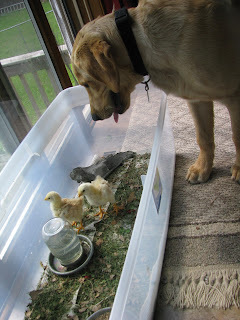 He has to learn the chickens are part of our family, so it is probably a good thing to have some in the house. I tried to get a broody hen to take them, but she hadn't been broody long enough to accept them. Okay off to find some big buttons and copper wire in town. If you're near St. Paul tomorrow, stop in and see me at Art in the Hollow, the weather is supposed to be perfect!